Big it up for Largs! Quote Reply Topic: Big it up for Largs! Is it me being home-sick or is Largs the best dinghy sailing venue in the UK? I'm not talking about the onshore facilites but just the pure sailing area, where else do you get such a large choice and different conditions at your disposal? The fact that 49 420's travelled all the way up there just for a weekend, surely goes to show its popularity?? Is this why a large number of Scottish/National Youth Squad members and Olympic Squad hopefulls have come from this area of the Firth of Clyde? Did Crewsearch there (dates me....) ended up with 2 boats sailing bow to bow, both reaching stbd tack, about 100 yards apart - wind was 180 degrees different, so yes, huge variety of conditions. The only place I've been where it rains more is Belgium. Best sailing location in the UK has to be Belfast Lough. 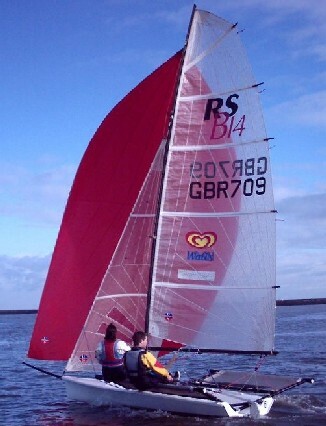 Not to tidal, good breezes, unobstructed course, no local wonders.... RUYC and Ballyholme YC have superb facilities. "head in bra" cup, Laser europeans, GP worlds etc etc....And IMHO the only plausable Americas Cup venue in the UK. Ye cannie hold that in Largs! Pity the political situation has persuaded people not to go. Don't vote against it 'til you've tried it. Better to be overpowered in the gusts than underpowered in the lulls! Had the worst event there in my life - Isn't the venue's fault though. Just a bad experience but unfortunately it sticks. It is impossible, however, to put a "best"sailing venue tag on anywhere in the world - too subjective. Everywhere has it's good and bad points depending on your preference. You could probably have a "most popular" tag though. And Ad, "IMHO the only plausable Americas Cup venue in the UK." about Belfast Lough, just proves my point. Humble indeed. My two pennies worth: I think Grafham has to be up there, at least top 10, huge uniterupted expance of inland water, wind is usually pretty flat as well. As for Largs, it certainly makes you think!, I guess if you can sail well there you can sail well in a lot of places, nothing like a good challenge. the 1st and 2nd of May! You must have been unlucky and had an easterly at the start of the season and been sailing between the mainland and the island. If you had been sailing out in the main channel it would have been some great sailing. Again whatever the weather there is always somwhere within reach that you will get decent sailing. Try that in the Solent when the 2 breezes are coming round each side of the island. As for Heyers you obvoiously haven't done the olympic week where you have to sail a good 1hr upwind after sailing back to the regatta centre with the mistral blowing against you. Decent waves though! A bad experience for the badge in Largs???? Hope it was sailing, and or alchol induced. As I remember, Haggis, it was may / june, and we were between the little island (Little Cumbrae?) and the island. As for direction of the wind - clearly everywhere! So where is the best location in UK? Where could you hold an AC, should it ever come here?